it's considered to be the city of traders; more laid back than Tokyo or Kyoto. I was told people are more spontaneous and open. What I will remember most vividly from my first visit though is concrete. A lot of heavy concrete. It can be beautiful at times in Japan. 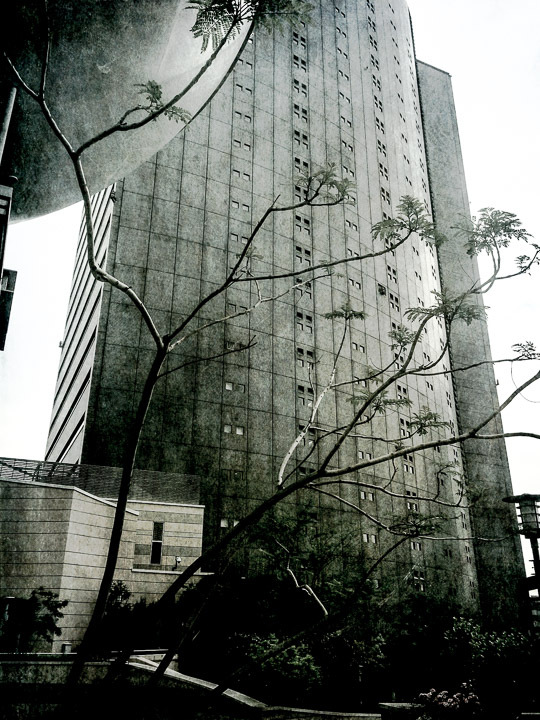 But here in Osaka, huge, heavy buildings felt ominous, rather depressing. Floating amid these giants, people -- and compared to Tokyo Osaka seems almost empty, its streets are so much less crowded, even deserted at times -- seem tiny and powerless. Why have I never experienced anything similar walking through Manhattan, amid skyscrapers that definitely are not smaller? Is it the buildings or the people? Or the air, the light and everything in between? Or myself? "You leave Tamara without having discovered it," ( Italo Calvino "invisible Cities"). Is it fair to try to "discover" the city just by walking its streets, by gazing at the signs (so many of which are hard to comprehend!)? Without resorting to words, without talking to its people? There is something exciting about traveling without being able to speak the language -- it forces you to be more observant, sharpens your senses, inspires to think more. But being able to rub somebody's skin -- streets, buildings, trees - you might still be so painfully remote from reaching inside, from touching the soul. "The eye does not see things but images of things that mean other things …Your gaze scans the streets as if they were written pages …However the city may really be, beneath this thick coating of signs, whatever it may contain or conceal, you leave Tamara without having discovered it."